I received a Skylander Superchargers Starter Pack to facilitate this review. All opinions are 100% my own. My family loves video games – being married to a computer nerd, I should’ve expected that, right? 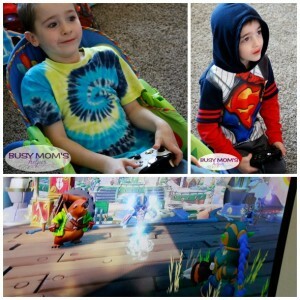 While we really watch the amount of time they get on the Xbox, we also make sure the majority of the time they do get is spent together, whether as siblings or as the whole family. I’m loving Skylanders SuperChargers because it encourages co-play and working as a team, plus many more reasons! As I said, you work TOGETHER in this game – one person can drive while the other mans the weapons system (canon, gun, whatever that vehicle has). It also doesn’t let one person wander off from the other; it’s a single shared screen so they have to stick together. This is especially helpful so my more-advanced kids are ‘encouraged’ to wait, be patient and help the younger ones. While there’s more than 40 characters and vehicles you can collect, there’s less that can be supercharged. That being said, you’ve still got LOTS of options, as you can see in the poster below! And in case you’re worried, any character can drive any vehicle 🙂 While the characters have different elements, such as fire (Spitfire) or magic, water, life, tech and others – the vehicles can be either land, water or air based. Our kids are learning which elements/vehicles work best for each obstacle or level. It’s great seeing their minds working as they problem solve! It’s easy enough to understand that our 4-year-old gets it just fine (with minor help from Dad), but also challenging enough that our 9-year-old finds it exciting. We all agree that the variety of characters, vehicles and things makes it really fun – all the colors, different powers, abilities, etc. really let you play the game YOUR way. Upgrades – what’s a game without upgrades, right? With Skylanders Superchargers you have multiple options – you can upgrade your CHARACTER, but also your VEHICLES. More shield power, different weapon systems, new tires, etc. The kids thought choosing new items was a BLAST! The starter pack includes the Portal, two characters (Spitfire and Stealth Elf) as well as one vehicle (Hot Streak). This way you can get a supercharged guy right from the start! I did find the portal was really crowded and occasionally we had to adjust the placement of all three things on there at a time, but it worked out fine. I also think that while you CAN do the game with just what comes in the starter pack, it’ll work a lot better (and be more fun) once you have more characters and vehicles to work with. If you only have two, then if one gets a lot of damage you have to wait while they heal. If you had more, you could just swap out as you needed. Overall, though, we’re loving this game and the kids are already saving up for certain characters and vehicles to play with! Which character would YOU be most excited to play?